India's PSLV-C16 rocket on Wednesday successfully launched into orbit the latest remote sensing satellite Resourcesat-2 that would study and help manage natural resources along with two nano satellites. ISRO's homegrown workhorse Polar Satellite Launch Vehicle placed in a 'Polar Sun Synchronous Orbit' Resourcesat-2, Youthsat and X-Sat about 18 minutes after it blasted off from the Satish Dhawan Space Centre launch pad here, 90 km from Chennai, at 10.12 am. "PSLV-C16 Resourcesat-2 mission is successful," a jubilant Indian Space Research Organisation Chairman K Radhakrishnan announced shortly after all the three satellites were hurled into space one after another 822 km above earth in a text book launch. The ISRO chief's announcement was cheered by the battery of scientists at the mission control centre who heaved a sigh of relief as they were gripped by an added anxiety following two successive failures of GSLV missions last year. The 1,206 kg Resourcesat-2 with a space life of five years replaces Resourcesat-1 launched in 2003 and would provide data with enhanced multispectral and spatial coverage on natural resources. The GSLV mission in December last year failed when the homegrown GSLV F06 carrying communication satellite GSAT-5P exploded mid-air less than a minute after lift-off and fell into the Bay of Bengal. GSAT-5P, carrying 24 C-band and 12 extended C-band transponders, plunged into the sea when the destruct command was issued as the rocket veered from its flight path. 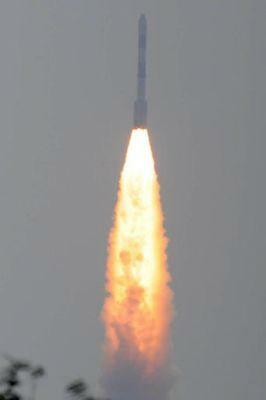 Earlier, the GSLV-D3 mission carrying GSAT-4 had also failed in April 2010, dealing a blow to India's space programme.